In a large pot, heat the butter and sauté the leeks until softened and fragrant. Add all the potatoes and sauté for a few minutes, then add the stock, cover and bring to the boil. Reduce heat and simmer gently until potatoes are tender. Add the cream. Use a stick blender to blend until smooth and velvety. Season with nutmeg, salt and pepper. Snoek topping: Heat the oil in a large pan and fry the bits of snoek until golden and crispy. Place to paper towel to absorb excess oil. 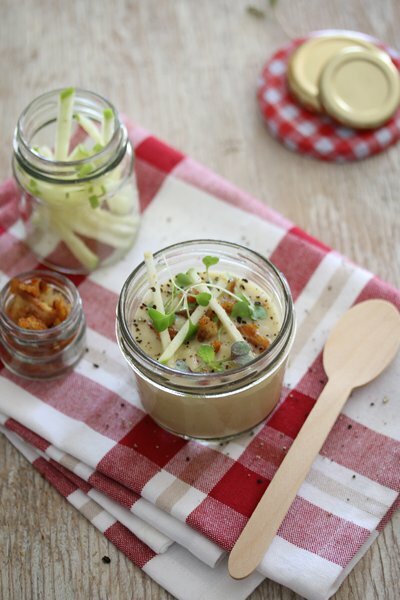 Serve soup chilled or warm topped with crispy smoked snoek, julienned apple and micro herbs.